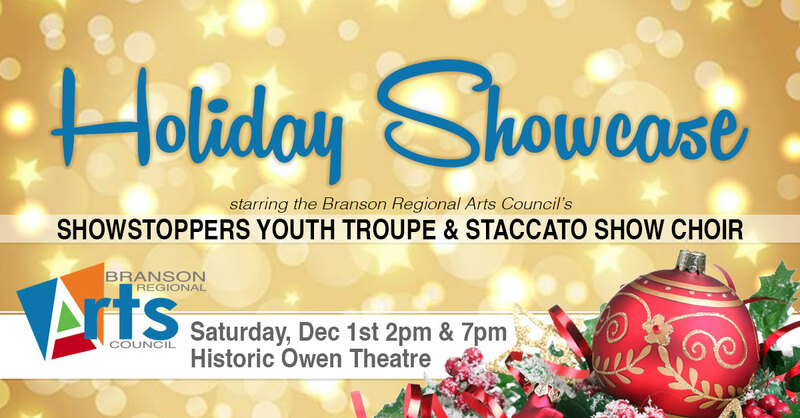 Branson area residents are invited to enjoy a special, one-of-a-kind Holiday Showcase Christmas Concert featuring the young talented members of the Branson Regional Arts Council’s Showstoppers Youth Performance Troupe as well as the Staccato Show Choir. There will be two performances on Saturday, December 1st at 2pm and 7pm at the Historic Owen Theatre. All seats are $10 and proceeds benefit the BRAC Youth Education Fund, which provides performing opportunities for area youth between the ages of 8 and 18. Showstoppers Youth Troupe is a group devoted to all things theatre! Students in the Youth Troupe meet weekly at the Historic Owen Theatre and encounter intensive, interactive studies in Voice, Acting, Stage Presence, Dance Choreography, and Team Work. The students develop both self confidence and respect for the skills required to be successful in the Theatre Arts. Staccato Show Choir is an energetic advanced musical group that combines a challenging music repertoire with entertaining choreography. The choir focuses on elevating and applying its formal training into lively, breath taking “show” style performances. Students meet at the Historic Owen Theatre and study advanced music theory, vocal warm up, stage etiquette, presence and showmanship, as well as multi-part choral music. General seating, no reservations required. Tickets may be purchased in advance online at BransonArts.org/showcase, or at the door. The Branson Regional Arts Council is a 501 (c)(3) non-profit organization and provides a wide variety of artistic events and theatrical programs for all residents in the Ozarks. Financial support for many of these programs is provided by the Missouri Arts Council and through the generous contributions of private donors and Arts Council members.